Aromatic Coffee Plant (Arabica Nana). 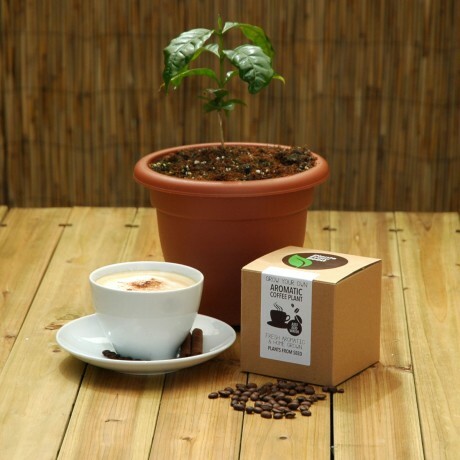 This kit includes everything needed to grow your own Aromatic Coffee Plants (Arabica Nana). An ideal little extra gift for any occasion, this Coffee Plant Kit is the perfect present for every fan of the roasted bean! Inside the Coffee Plant Kit is two terracotta coloured small plant pots, one professional grow pellet and your coffee plant seeds. An instruction sheet is also included on how to grow and take care of your new arrival. The seeds have a shelf life of 12-18 months. Fantastic quality- very competitive price compared to the same product on other websites. I bought this for a Christmas Gift. I bought this for a Christmas Gift. It came very well wrapped and I am very pleased with it. The price is unbeatable as the quality is very good.